Clean and safe water is an important natural resource for the sustainability of life and a healthy economy. Freshwater availability is one of the major problems facing the world and approximately one third of drinking water requirement of the world is obtained from surface sources like rivers, dams, lakes and canals . These sources of water also serve as best sinks for the discharge of domestic and industrial wastes [2, 3]. The biggest threat to sustainable water supply in South Africa is the contamination of available water resources through pollution . About 43, 000 of South Africans might die annually as a result of diarrhoea diseases. Many communities in South Africa still rely on untreated or insufficiently treated water from surface resources such as rivers and lakes for their daily supply, and have no or limited access to adequate sanitation facilities thus at are a high risk of waterborne diseases . Since 2000, there has been a dramatic increase in the episodes of waterborne diseases in South Africa [5, 6]. Nevondo and Cloete , reported that there are constraints in the provision of bulk supply of potable water to rural areas of South Africa despite the intervention of the government. Some of these constraints are largely due to insufficient allocation of funds and inadequate human resources. In communities where potable water is supplied, it is usually erratic and unreliable forcing residents to revert to surface water from rivers for their domestic needs [7, 8]. One of the major threats to public health by the use of such contaminated water is the presence of high concentration of pathogens capable of compromising the health of the people that drink and use the water for recreational and agricultural purposes . Faecal contamination is one of the priority environmental problems associated with the use of surface water . Diseases may be transmitted not only through the drinking of contaminated water, but also through skin contact during recreational activities or by eating raw crops irrigated with contaminated water . Water resources can be directly contaminated by natural runoff after rainfall events, effluents from wastewater treatment facilities, agricultural and industrial effluents and several other anthropogenic activities [10, 11]. Since it is extremely difficult to test for each pathogenic organism present in water due to large diversity, low abundance of each species and the absence of standardized methods for their detection; regulatory authorities have resort to the use of indicator organisms [12-16]. Several indicator organisms and pathogens used to assess the microbial contamination of water include total coliforms count, faecal coliforms, faecal streptococci, coliphages, C. perfringens, Salmonella and heterotrophic plate counts [8, 17, 18]. The drawbacks of some of these methods for routine monitoring have further led to the preference of some over the others [19, 20]. E. coli is a widely accepted indicator organism for drinking water; although its use has been criticized by some scientists, it is still widely used for routine monitoring of domestic water [20, 21]. The United State Environmental Protection Agency (USEPA) has prescribed Enterococci and E. coli as the most appropriate indicator organisms for recreational water due to a study conducted on beaches in the United States of America . It is therefore necessary to estimate the water quality of Nzhelele River which is used by residents of several communities surrounding it for domestic, recreational and agricultural purposes so as to prevent any episode of waterborne diseases. Nzhelele River in Limpopo province (22o21’08” S and 30o22’19” E) is a major watercourse in Limpopo province of South Africa . Nzhelele River have Mutamba, Tshiruru, Mufungudi, Mutshedzi and Wyllie Rivers as its tributaries. It joins the Limpopo River 33 km east of Musina. The river catchment area is 2, 436 km2 and have an average annual precipitation and evaporation of 422 mm and 2160 mm, respectively . The region is semi-arid with seasonal rainfall events. Rainfall, temperature and humidity data of the river catchment were obtained from the South African Weather Service Table (1). Daily temperature in the catchment varies between 20–40oC (wet season) and 12–22oC (dry season), respectively [24, 25]. The region is characterized by a warm wet season which is associated with high temperatures up to 40°C usually between October and March (with peak precipitation in January and February) and cold dry season (April-September). Upstream land use in the catchment area includes subsistence and commercial agriculture, schools, formal and informal human settlements, hospital, garages, waste stabilization ponds (WSPs), brick making factories, sand and gravel mining . Brick making are usually done at the bank of the river. Siloam WSPs releases its hospital effluent directly into the river. Abstraction of water from the river for drinking and other domestic purposes without treatment is a common practice. Pipes are usually connected to the river by farmers for irrigation of their crops. Low scale fishing is done further downstream of the river. The Map of the study area is shown in Fig. (1). There is limited water infrastructure and high unemployment around villages in Nzhelele River catchment. The major source of drinking water for the people around the river catchment is potable water supplied from the Municipal Water Works, however, this supply is erratic and people are forced to look for alternative sources. Residents depend mainly on groundwater, springs and river water . Table 1. Climate data of the river catchment. Where Avg is average, min is minimum, max is maximum, Temp is temperature and Hum is humidity. Fig. (1). 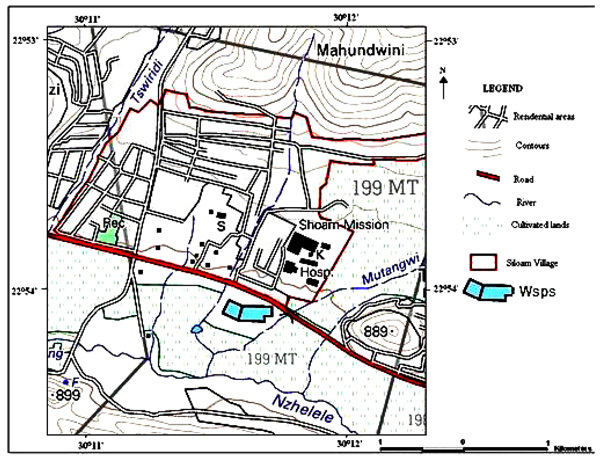 Map of the study area . All sample bottles used were soaked in a livid detergent, followed by rinsing with tap water until they were free of detergent. Six samples were collected monthly from 30th January to 10th June, 2014, making a total of 36 samples. The samples were collected randomly along different sampling locations in Nzhelele River using sterile sampling bottles. Each sample was collected by submerging the sample container into the river at about 100–300 mm below the surface with an open end facing against the current flow direction . Field measurements of pH and Electrical conductivity (EC) were performed using a 340i Multimeter (WTW, Weilheim, Germany) while Turbidity was measured with a Tobcon turbidimeter (TB200, Orbeco Hellige, Sarasota, FL, USA). The samples were transported on ice chest to microbiology laboratory of the University of Venda. All samples were analysed within 6 hours of collection as recommended by the American Public Health Association (APHA) except for January samples which were analysed within 16 hours of collection this was because of difficulties to reach the sampling sites due to heavy rainfall encountered on the way before reaching them. Each water sample was analysed for E. coli and Enterococci levels. Samples (100 mL) were diluted (1:10) in accordance with level of pollution, and analysis was performed using the membrane filtration culture method in accordance with the standard methods described by APHA . The method reported by Edokpayi et al. was employed in this study: The samples were filtered through 0.45-micron syringe filter and placed in an autosampler connected to Metrohm 850 Ion Chromatograph (IC) supplied by Metrohm, Switzerland. Calibration standards for fluoride, chloride, nitrate and sulphate were prepared from two multi element standards. 1 mg/L, 5 mg/L, 10 mg/L and 20 mg/L were prepared by serial dilution from a stock solution of 100 mg/L. The eluent used was a combination of Na2CO3 and NaHCO3; prepared by weighing accurately 0.168 g and 0.6784 g into 2 L volumetric flask and filled to the mark using ultrapure water. 0.5M sulfuric acid was used as a regenerant solution. Prior to analysis, the eluent was degassed using an ultrasonic bath for 15 minutes. The IC has a flow rate of 0.7 mL/min, maximum and minimum pressure of 15.0 mPa and 0.1 mPa respectively. Total E. coli and enterococci counts in the samples from six different sites along the river are presented in Fig. (2) The box-and-whisker plots which indicate the mean (diamond) of the levels of E. coli and enterococci in each site, the first, second, and third quartiles (box), and minimum and maximum (whiskers) are also presented in (Fig. 2). The percentage recovery obtained for fluoride, chloride, nitrate and sulphate concentrations were 93%, 96%, 95% and 97%, respectively. The average pH values ranged between 7.21-7.76 Table (2). The average EC values varied from 83.47 -136.07 µS/cm, during the sampling period. Fig. (3) shows the turbidity values measured during the sampling periods. Table 2. Average level of physicochemical parameter analysis. Fig. (2). 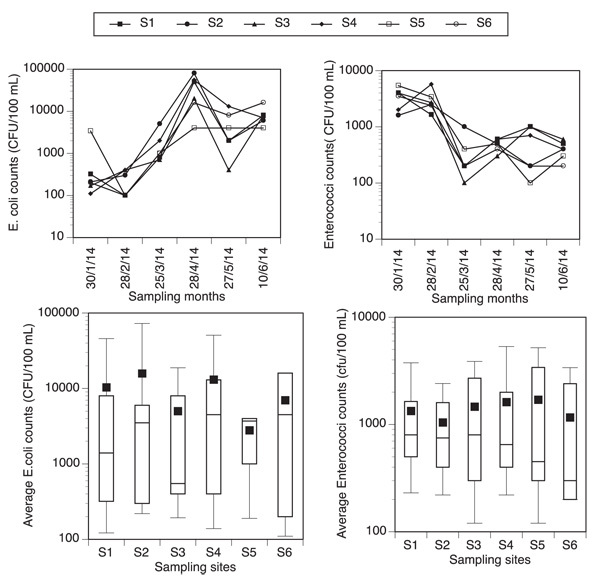 A logarithmic plot showing the total counts of E. coli (top left) and Enterococci (top right) and the box-and-whisker plots of E. coli (down left) and Enterococci (down right) in the sampling sites along Nzhelele River. 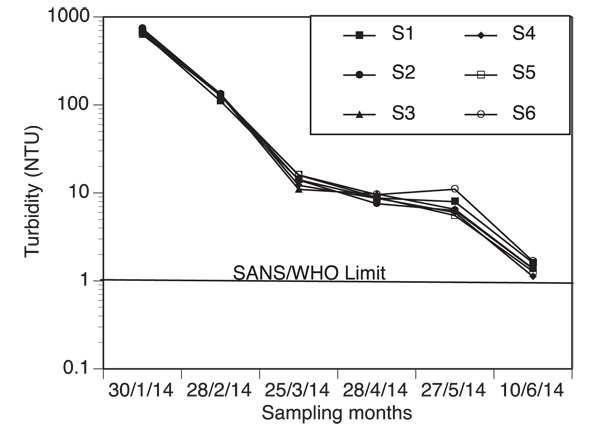 The SANS and WHO permissible limit for faecal coliform (E. coli and Enterococci) in drinking water is 0 cfu/100 mL). Fig. (3). Turbidity levels of water samples collected from January-June, 2014. The SANS operational and aesthetic permissible limit of turbidity for drinking water is 1 and 5 NTU, respectively. Low levels of anions were found in the water samples collected from the various sampling sites Fig. (4). All the anions investigated complied with the SANS permissible limit of drinking water. Table 3 shows the level of correlation and significance between physicochemical and microbiological parameters in the wet and the dry season. Fig. (4). Box-and-whisker plots showing nitrate (top left), sulphate (top right), fluoride (down left) and chloride (down right) concentrations in the various sampling sites of Nzhelele River. SANS permissible limit of nitrate, sulphate, chloride and fluoride in drinking water are >40 mg/L, 250 mg/L, 300 mg/L and 1.5 mg/L, respectively. Table 3. Results from correlation and statistical mean difference between physicochemical and microbiological parameters of Nzhelele Rivers in the wet and the dry season. **mean difference and correlation is significant at the 0.01 level (2-tailed), * mean difference and correlation is significant at the 0.05 level (2-tailed). The p-value for significant correlation is not presented in this table. High levels of E. coli and enterococci were found in the river water which could pose a health risk to the consumers of this water resource. Higher E. coli levels were found in the dry season (April-June) than in the wet season (January-March) (Fig. 2). A different trend was observed as higher levels of enterococci were recorded in the wet season. The results in the wet season is unexpected because of more incidence of rainfall which could lead to high surface runoff into the river, also owing to poor solid waste and wastewater collection systems within the river catchment. Retamozo et al. have shown that bacteria counts are expected to be higher during rainy season and in turbid water which is not the case for E. coli in this study. The reason for this finding could also be due to high temperature during wet season which is characteristic of the study area than during dry season, thus providing a good temperature for the incubation of bacteria. During the wet season, most animals are restricted to farms since there is sufficient water for them collected from rainwater harvesting. The high level of E. coli determined in the dry season could be due to high incidence of human and animal wastes in the water during the dry season which is so limited in the wet season. During the dry seasons, there is scarcity of water, and people including animals often resort to river waters. Edokpayi  reported that Siloam waste stabilization ponds discharges effluent with E. coli and enterococci levels in the range of 2 x 103- 7.7 x 105 cfu/100 mL and 2 x 103-7 x 104 cfu/100 mL, respectively into Nzhelele River. The contribution of this point source and other non-point sources definitely contributes to the high levels of faecal contamination determined in Nzhelele River. Enterococci counts were higher as expected in the wet season than in the dry season January-March) (Fig. 2). The highest level was observed in January in the wet season (3.42 x 103 cfu/100 mL) and the lowest counts in June (4 x 102 cfu/100 mL) in the dry season. The average counts of E. coli were higher than enterococci count but there was negative correlation between the levels of both indicator organisms. Several trends have been reported for bacteria levels in surface water; some of which are higher in the wet season and others in the dry season [25, 35-38]. There are several environmental drivers that influence the levels of bacteria in water. Generally, high sediment load from land into surface water bodies due to rainfall events usually lead to high counts of faecal indicator organisms. Temperature is another factor that could influence the levels of pathogenic organisms in surface water. Bacteria grow faster at higher temperature than at lower temperature. High levels of nutrient also influence the growth rate of bacteria. Levy et al. reported that bacterial levels in water are due to a complex interaction of various effects in varying conditions at different times. A higher count of faecal indicator organism was reported by Sibanda et al. in Dryini sampling point during the dry season than in the wet season in their studies on Tyume River in Eastern Cape Province in South Africa which was opposite to the findings of Fatoki et al. in Umtata River catchment. The results obtained indicate that water from Nzhelele River is unfit for domestic use as it exceeded the SANS and WHO permissible limit of 0 cfu/100 mL [31, 32]. The river water is also not suitable for recreational and agricultural water use as it exceeds the permissible limit of the South African Department of Water and Forestry guidelines (≤130 cfu/100 mL and ≤1 cfu/100 mL, respectively) for such uses . The presence of suspended substances in water like clays, silts and micro-organisms causes a cloudy appearance of water. The values obtained for turbidity measurements varied greatly as expected from January to June. Very high turbidity values were obtained from January-March which is the wet season of the study area than from April-June (dry season). This could be due to more incidence of rainfall in the wet season. In the upstream of Nzhelele River, there is sand mining, bricks making industries at the bank of the river and commercial faming, therefore, runoff during rainfall events can lead to increased sedimentation of the river thus contributing to high turbidity values determined in the wet season. The mean values obtained for both seasons were higher than SANS and WHO permissible limit of ≤1 NTU for domestic water use [31, 32] Fig. (3). The average turbidity values varied significantly for both the wet and the dry seasons (p<0.05). Rainfall data in the catchment area varied between 0.5 mm and 258.82 mm Table (1). Highest precipitation was observed in January and the lowest in June. There was a slight change in the precipitation pattern of the study area. January and February are usually the months with highest precipitation in the river catchment but in this study, the highest precipitation was recorded in January and March. The average monthly temperature however decreased from 24.1oC in January to 17.5oC in June. The pH and conductivity levels obtained in this study complied to various regulatory standards for drinking water. Low EC values were obtained upstream of the rivers while higher values were obtained downstream due to anthropogenic activities. Higher EC values was measured and computed for the dry season than in the wet season (Table 2). Low EC could be due to dilution effect as a result of more volume of water in the river due to increased precipitation. However, in the dry season, dilution effect is cancelled out, this coupled with evaporation can lead to increased levels of dissolved ions concentration in the river water. Table 4. Results from the correlation studies on the various parameters investigated in Nzhelele River. EC is electrical conductivity, T is turbidity, Ent is enterococci; *correlation is significant at 0.05 level (2-tailed); ** correlation is significant at 0.01 level (2-tailed). The concentrations of the anions determined did not present any health risk to the health of the consumers of this resource. Although high concentration of fluoride exceeding 1.5 mg/L can affect the bones and teeth of humans, the average levels observed in this study was lower than 1 mg/L for each sampling month. Nitrogen is an important plant nutrient and often applied to agricultural lands to enhance plants productivity. Although various forms of agriculture are practiced in the study area, the concentrations of nitrates determined complied to SANS guidelines for safe drinking water . Jonnalagadda SB, Mhere G. Water quality of the odzi river in the eastern highlands of Zimbabwe. Water Res 2001; 35(10): 2371-6. Das J, Achary BB. Hydrology and assessment of lotic water quality in Cuttack City, India. Water Air Soil Pollut 2003; 150: 163-75. DWAF. Water Quality Management series guideline document U1.5. Guideline for the management of waterborne epidemics, with the emphasis on cholera 2002 First Edition..
 Bessong PO, Odiyo JO, Musekene JN, Tessema A. Spatial distribution of diarrhoea and microbial quality of domestic water during an outbreak of diarrhoea in the Tshikuwi community in Venda, South Africa. J Health Popul Nutr 2009; 27(5): 652-9. Obi CL, Potgieter N, Bessong PO, Matsaung G. Assessment of the microbial quality of river water sources in rural Venda communities in South Africa. Water SA 2002; 28(3): 287-92. Hazen TC. Faecal coliforms as indicators in tropical waters: A review. Toxic Assess 1998; 3: 461-77. Servais P, Billen G, Goncalves A, Garcia-Armisen T. Modelling microbiological water quality in the Seine river drainage network: past, present and future situations. Hydrol Earth Syst Sci 2007; 11: 1581-92. Busari O. Groundwater in the Limpopo Basin: Occurrence, use and impact. Environ Dev Sustain 2008; 10(6): 943-57. Odiyo JO, Chimuka L, Mamali MA, Fatoki OS. Trophic status of Vondo and Albasini Dams; impacts on aquatic ecosystems and drinking water. Int J Environ Sci Technol 2012; 9: 203-11. Mzezewa J, Misi T, van Rensburg LD. Characterisation of rainfall at a semi-arid ecotope in the Limpopo Province and its implications for sustainable crop production. Water SA 2010; 36: 19-26. Edokpayi JN, Odiyo JO, Msagati TA, Potgieter N. Temporal variations in physico-chemical and microbiological characteristics of Mvudi river, South Africa. Int J Environ Res Public Health 2015; 12(4): 4128-40. American Public Health Association 1992.. Standard methods for the examination of water and wastewater. American Public Health Association, Washington, DC American Public Health Association, American Water Works Association, and Water Pollution Control Federation, 1998, Standard methods for the analysis of water and wastewater 18th Ed.. 1998; 48-58. Edokpayi JN, Odiyo JO, Msagati TA, Popoola EO. Removal efficiency of faecal indicator organisms, nutrients and heavy metals from a peri-urban wastewater treatment plant in thohoyandou, Limpopo Province, South Africa. Int J Environ Res Public Health 2015; 12(7): 7300-20. Guidelines for Drinking Water Quality 3rd ed. 2003. Retamozo B, Shabahang S, Johnson N, Aprecio RM, Torabinejad M. Minimum contact time and concentration of sodium hypochlorite required to eliminate Enterococcus faecalis. J Endod 2010; 36(3): 520-3. Levy K, Hubbard AE, Nelson KL, Eisenberg JN. 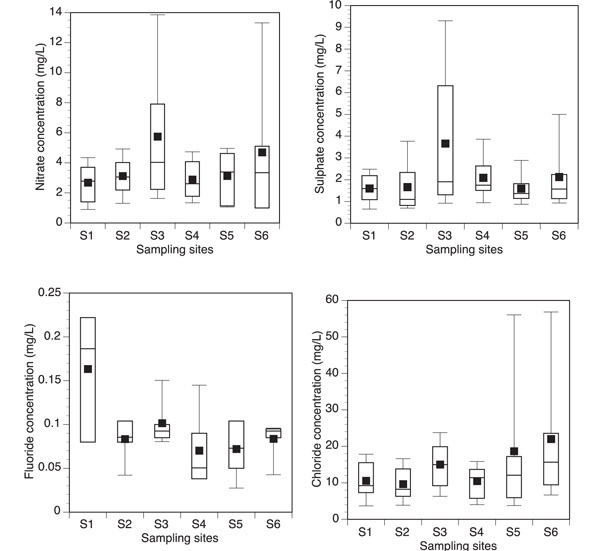 Drivers of water quality variability in northern coastal Ecuador. Environ Sci Technol 2009; 43(6): 1788-97. Howard G, Pedley S, Barrett M, Nalubega M, Johal K. Risk factors contributing to microbiological contamination of shallow groundwater in Kampala, Uganda. Water Res 2003; 37(14): 3421-9. Dorner SM, Anderson WB, Gaulin T, et al. Pathogen and indicator variability in a heavily impacted watershed. J Water Health 2007; 5(2): 241-57. Kleinheinz GT, McDermott CM, Hughes S, Brown A. Effects of rainfall on E. coli concentrations at door county, Wisconsin Beaches. Int J Microbiol 2009; 2009: 876050. Sibanda T, Chigor VN, Okoh AI. Seasonal and spatio-temporal distribution of faecal-indicator bacteria in Tyume River in the Eastern Cape Province, South Africa. Environ Monit Assess 2013; 185(8): 6579-90. Fatoki OS, Muyima NY, Lujiza N. Situation analysis of water quality in the Umtata River catchment. Water SA 2001; 27(4): 467-74.